Update: More info added and a video preview of the app below. 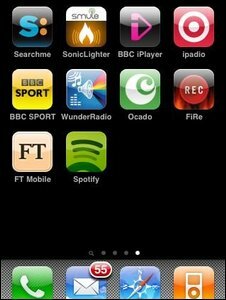 Spotify, the free streaming music service is Europe is due to come to the iPhone this week as a mobile application. The Swedish based firm has submitted the app to Apple’s iTunes App Store and is waiting for approval which should be this week. Although details are sketchy at present, it is anticipated users will be able to download songs and playlists to their iPhones to listen on the go. This service will only be available to premium customers though, who pay the £9.99 a month. No details on the app cost either, but assuming it will only be used by premium customers, I can’t see this costing alot. Syncs via wifi, no cables here! Spotify, is subsidised by targeted adverts during playback (a bit like radio, but hardly noticeable) and premium users paying a monthly fee for no adverts. It as seen as a great alternative to piracy. It launched last year in Europe and expect a possible stateside release late this year to add the the already 6 million subscribers.